My esteemed Russian colleague reminds me that her people really know how to dance. She shared with me these videos, which I'll share with you. Let's roll back the rug and join 'em! Wilbur, start the barking now! I learned today on Carol Novack's blog of Anna Russell's passing. The result was one of the funniest, most unique voices in history. I adore her version of Wagner's "Ring." I need to learn how to turn moments of disappointment--clashes between ambition/expectation and the realities of my given talents--into something pure and real. But how? What is the THING I have to offer the world? How am I nutty and unique? Today, I have no idea. What about you? What is your unique thing? How has accident shaped it? When did the river reroute, and did you follow the new route, or fight to get back on course? I think I’m suffering from Blog Procrastination. It’s what happens when I have way too many things to talk about and next thing you know the list is a mile long. Anyway, here’s what I’ve been reading, in a chaotic burst. My friend Pia is down in New Orleans being a Swiss journalist and bilingual blogger. She’s been getting firsthand stuff since Katrina (flew down from NY with her cameraperson a week after the storm, been there on and off since) and her followup has proven quite interesting—a cross between a European view of this distinct American culture and a humanitarian view on the current money flow problems. Check her out! And don’t skip the video from Troy “Trombone Shorty” Andrews. My other journalist friend Rob moonlights from his financial-journalist job on his blog, The Luna Park Gazette. He’s been exploring his Brooklyn roots, and talking about his Dad’s recent move to a rehab facility following a stroke. The facility is in Coney Island , and in typical Rob gallows-humor, he remarks, “the Stillwell Avenue station is the end of the line, literally, for several trains. Walking into this facility, it’s hard not to think of the word ‘terminal.’” Check out his post to find out what movie is playing in the patient lounge…thanks Rob, for making me cry at the office…it’s really bittersweet stuff. I’ve been grooving on the Craftzine Blog too. Lots of daily posts, enabling the proj-aholic. Ach! This should be blocked from my machine. It’s like crack. 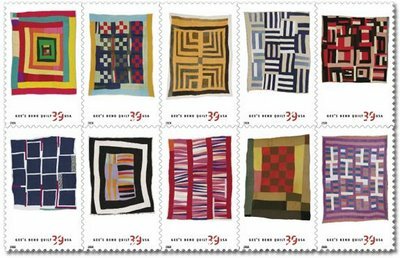 Speaking of craft, not crack, have you seen the new Gee’s Bend Quilt postage stamps? Gorgeous! I can’t stop looking at my new stamps. 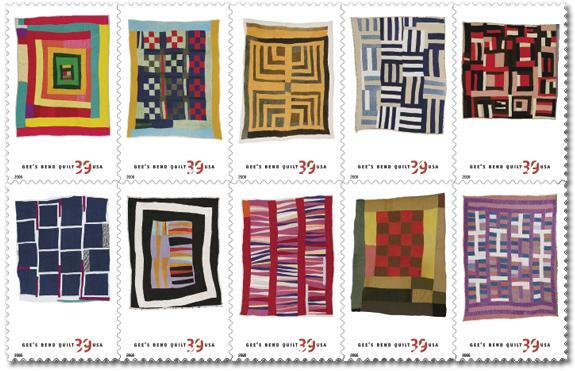 Or these quilts. To me, these people are like rock stars. They are giving me ideas. Just what I need, more ideas. I got a radio tip for you fellow podcast junkies: PublicRadioFan.com. It’s an awesome podcast directory, through which I found the Writer’s Voice series. Listen to the session in which Spencer Overton talks about his book Stealing Democracy: The New Politics of Voter Suppression, and Francine Prose talks about Reading Like a Writer: A Guide for People Who Love Books and For Those Who Want to Write Them. I can’t wait to read the Francine Prose book. I may even have to buy the hardcover. 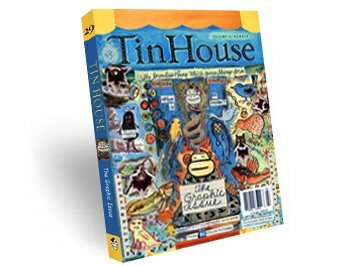 And also on the literary front, Tin House #29 is a must-buy. Not only does it have a cover and several graphic pages by Lynda Barry (plus an interview with same, in which she talks about selling her work on Ebay), it has superheroes dug out of the mothballs, drawn by younger versions of lit-heroes Michael Chabon, Jonathan Lethem, Chris Offutt, et al. This is a full-color dream of an issue. 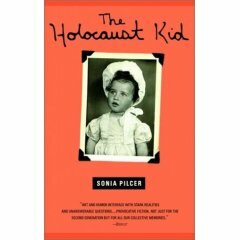 One of my mentors, Sonia Pilcer, wrote a linked short story collection called The Holocaust Kid, then adapted it into a play. I'm going to the Friday night performance. See you there? In a world where there seems to be a code of rules about how the Holocaust should be discussed, Sonia Pilcer dares to dissect the rules themselves, from a very personal vantage point, in The Holocaust Kid. This collection of stories centers around Zosha, a very American young woman whose parents are survivors. The weight of the Holocaust and the necessity of remembrance is an everpresent burden to Zosha, for whom these "memories" are important but also surreal, dependent on the multitude of stories shared among her parents and their friends. Survivor's guilt is passed down to the second generation, in an adulterated, confusing form that leaves Zosha simulaneously alienated and obsessed with the residue of the war. And I Thought I Was a Proj-Aholic. On a tip from Make Magazine, I went to a Swap-o-Rama on Sunday, held at Third Ward in Williamsburg. Here's how it worked: you bring a bag of clothes you don't want and $10. People sort the stuff onto tables, and you wander around and take as much as you can carry. 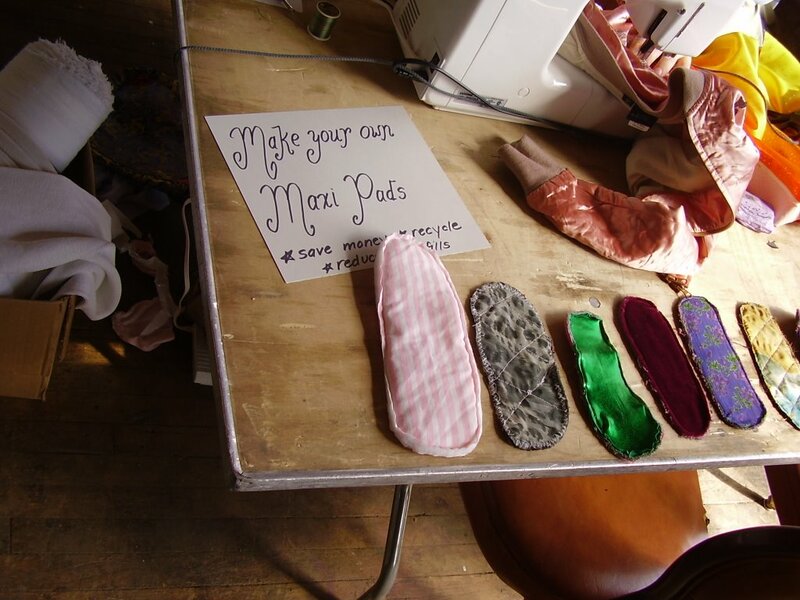 During breaks from the digging, you can have a cocktail, talk to a stylist, or learn how to make your own maxipads. 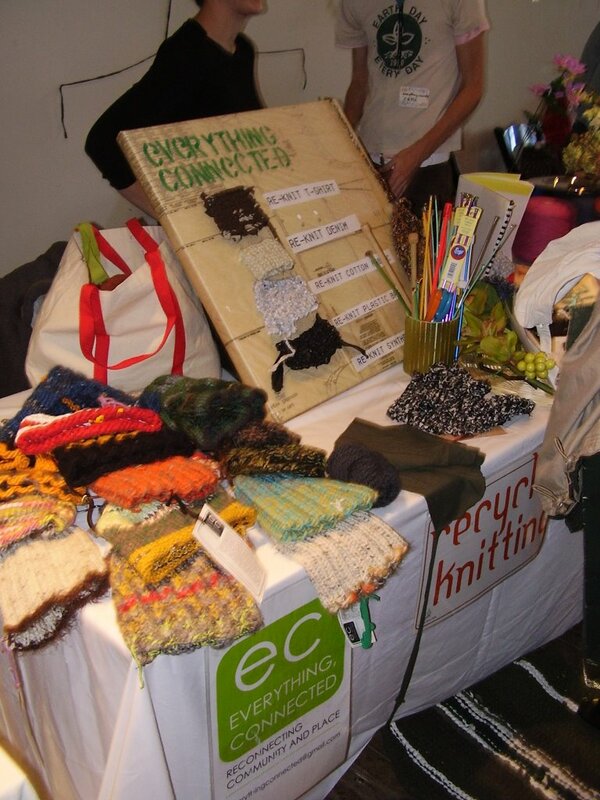 They had lots of workshops, like tee shirt redesign, silkscreen, applique, and my personal favorite, re-knitting. Look, they have samples of re-knit tee shirt, denim, and even plastic grocery bags. I scored a zebra striped raincoat and some red snake-patterned pants. And, I got a free copy of the new Craft magazine, which has cool articles about knitting with telephone poles and embroidiering your skateboard, among other things. Craft has a whole slew of photos of the Swap-o-Rama here at flickr. 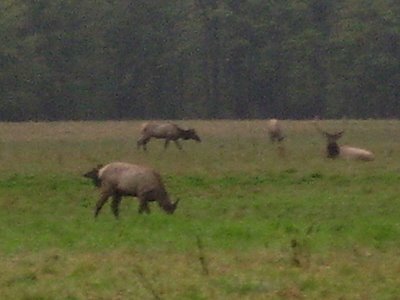 I went to visit my family out West. (I'm from there, though I've lived in NYC longer than anywhere else.) 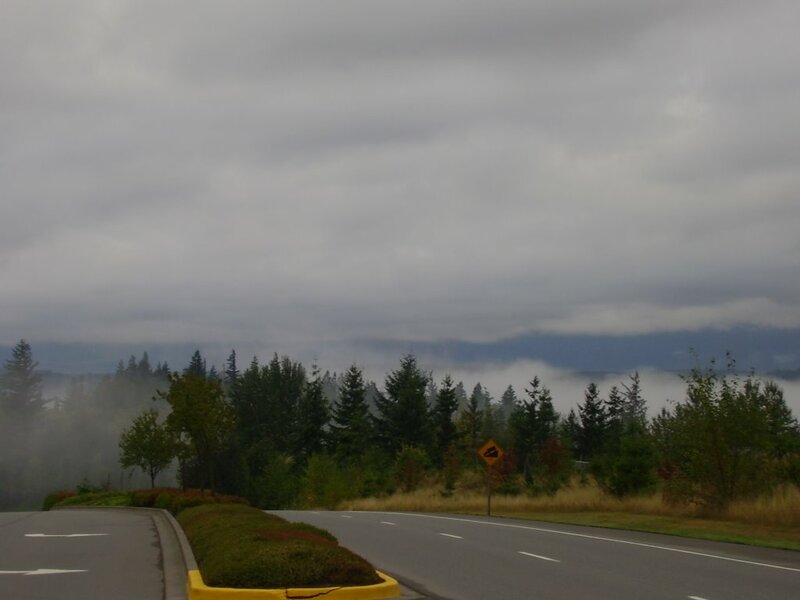 My first stop was Snoqualmie, Washington, where my folks live, in the foothills of the North Cascades. 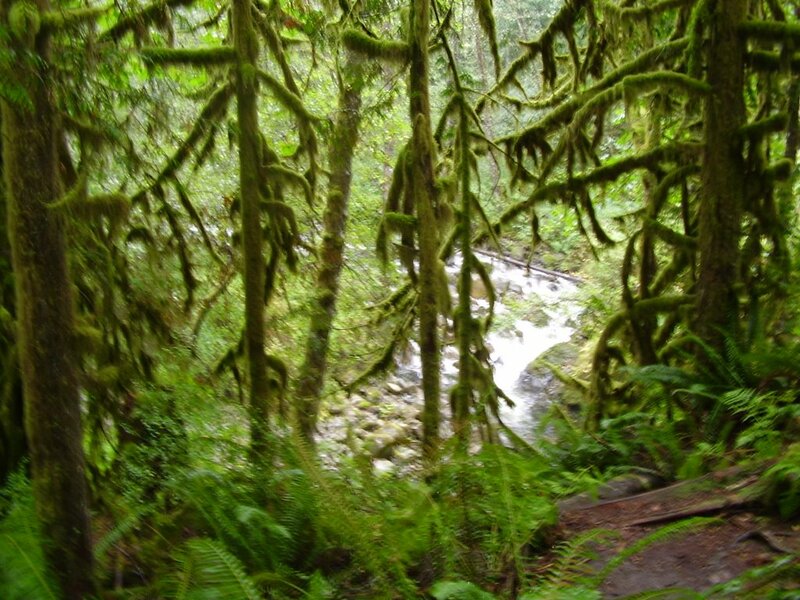 My brother flew up from Los Angeles and the two of us went on a hike to Wallace Falls. 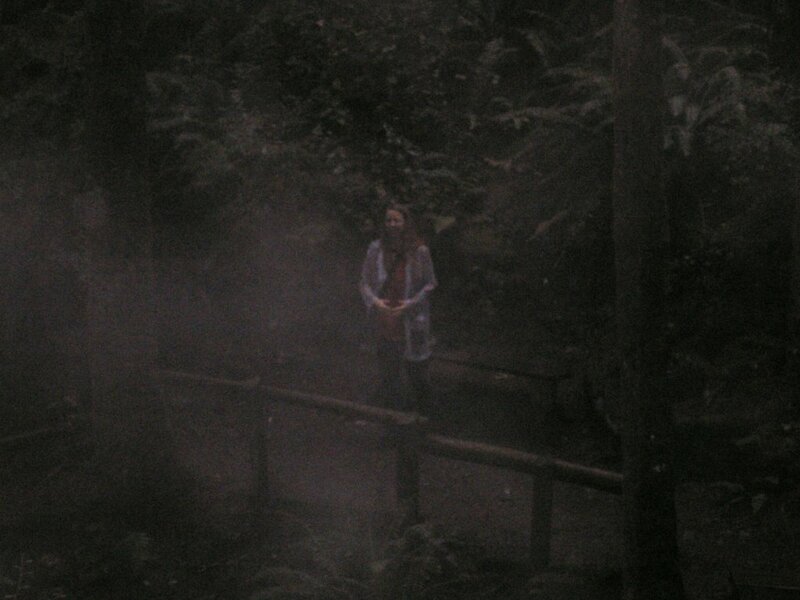 He took the above pic of me, under the evergreen canopy, sheltered from both rain and light. I'll leave the family out of the pictures, since I haven't asked their permission. I keep forgetting to do that. 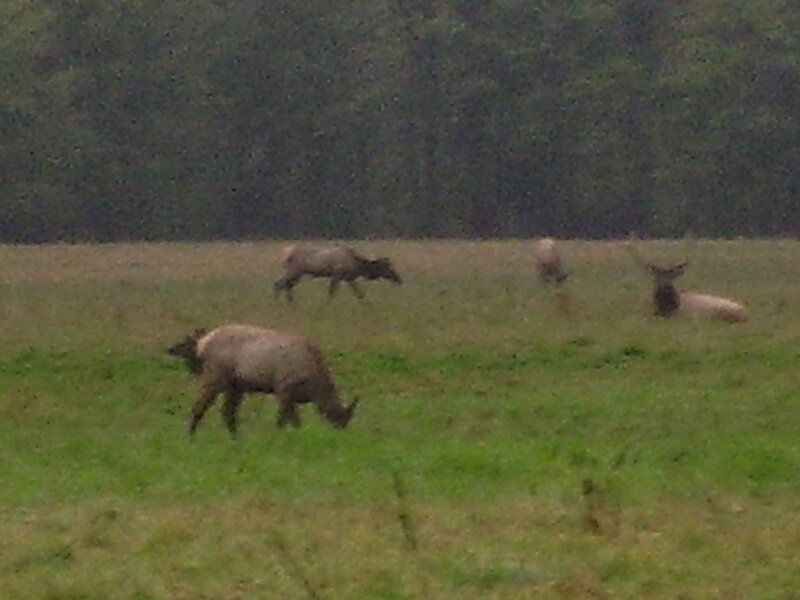 But I did see a few things other than family. Like a whole lot of coffee kiosks. This is a phenomenon we don't have out East. 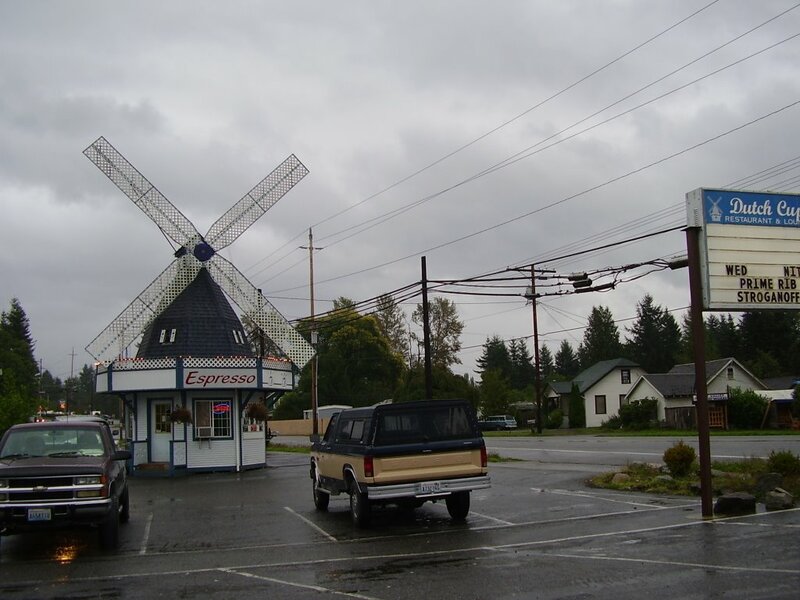 We don't have windmills that serve cappuccino in the middle of nowhere. And I got some gardening tips from my talented stepmom. 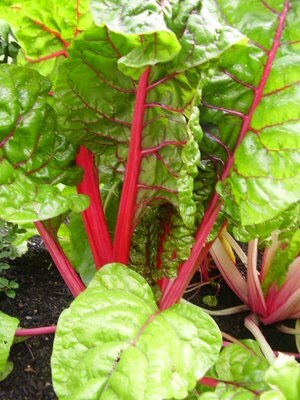 Check out her chard! 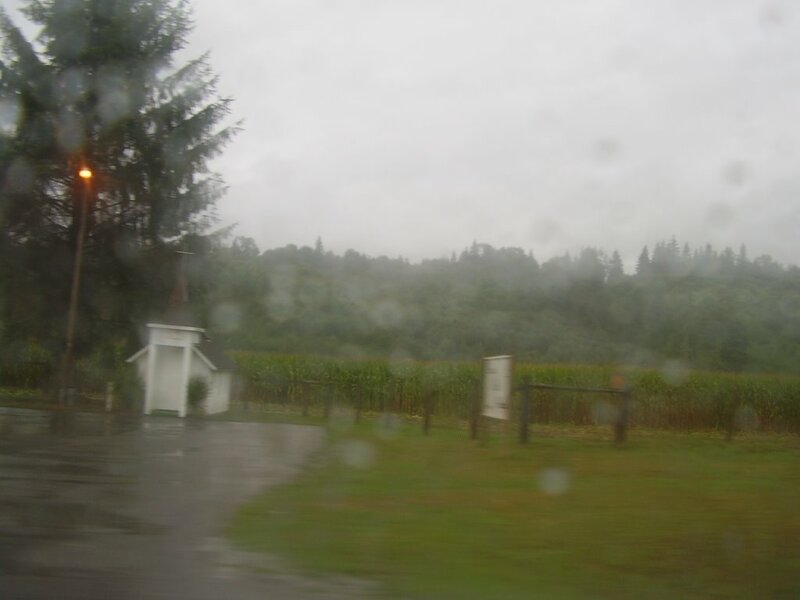 I had a blast from the past, driving past this "Wayside Chapel," about the size of a big doghouse, which I used to love when I was little. It shrank a LOT. Then my bro and I flew down to LA for the weekend. We went to the Museum of Jurassic Technology, where they had a beautiful exhibition of portraits of Soviet space dogs. Highly recommended! Plus, the tea is free! I had a day alone in LA, so I bought tee shirts at my favorite thrift store in Culver City, strolled the beach a little, and went to LACMA for the very-cool Breaking the Mode show. 1980's fashion was so wild! Issey Miyake is such a brain! He's is the one who inspired me to go to fashion school, where I got jaded fast and transferred to the sculpture department. But this show made me remember what I used to love so much about sewing. Maybe I'll dig out the old machine. 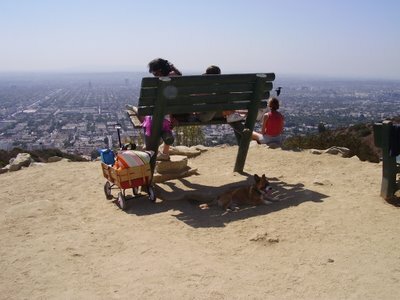 And I got to hike Runyon Canyon with my bro, his excellent wife, and many cute dogs I don't know. The dogs were grabbing slivers of shade, gulping water, and panting like crazy. 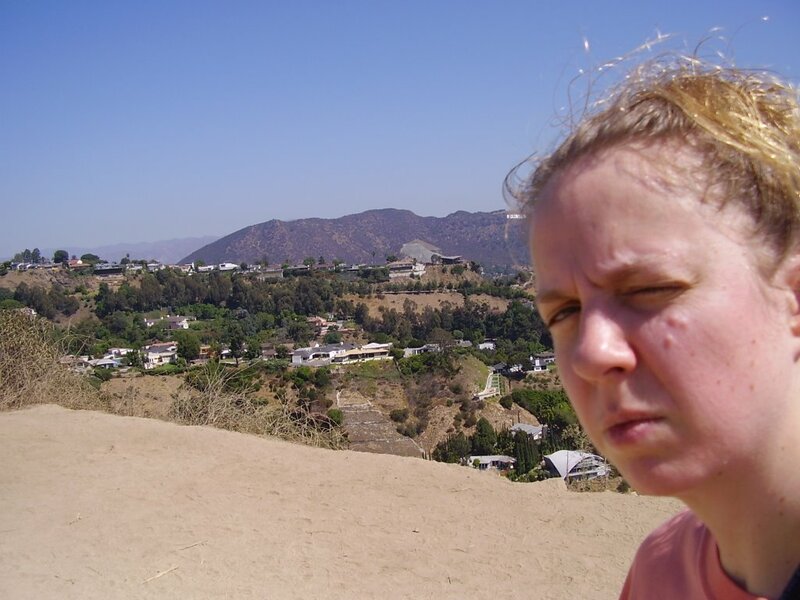 Me, I wish I brought my sunglasses. Here I am with the Hollywood sign sticking out of my forehead. In the last remaining hours of my thirties, I am doing irresponsible things like blogging at work. Please forgive me, work. I am still a tender young thing. I am also wearing pink striped socks, which are totally inappropriate. Tomorrow I'll be crossing the line. Me and my birthday-mate Sherman Alexie. Happy birthday, Sherman, and have a great reading tonight at the New Yorker fest! I won't be there, I was too slow to get tickets. This weekend I celebrate by eating french toast at the diner, then going to the movies, probably The Science of Sleep. And hugging my incredible Brooklyn family. Especially that cute guy I married.